Garmash Handsigned and Numbered Limited Edition Embellished Giclee on Canvas: "Music in the Afternoon "
About the Artist: It all started in the little town of Lugansk in Ukraine, 1969. An early starter, Mr. Garmash began painting at the age of three. By age six he started his formal education at the Lugansk Youth Creative Center. Recognizing rare, natural talent, his teachers sent his works to a variety of exhibitions in the then Soviet Union. An award winning artist from the onset, Mr. Garmash received first prizes at several juried exhibitions, including the Lugansk Regional Juried Exhibition-1977 (Best Poster), the Czechoslovakian International Youth Competition-1978, and the Hungarian International Art Competition of Circus Related Art-1978. After graduating, valedictorian from the Lugansk State Fine Art College in 1987, Mr. Garmash began teaching there the following year. From 1989 to 1991, he served in the army (when he met his wife and partner, Inessa) and in 1992 began studying at the St. Petersburg Academy of Art. Prior to graduating at the top of his prestigious school's class, Mr. Garmash exhibited in France at galleries in cities such as Paris, St. Etienne, Avignon, Lion and Marcel. Mr. Garmash also took part in the annual Exhibitions in St. Petersburg, Russia. In addition to painting, he has also excelled in the creation of stained-glass windows and received an honorary medal for his work in the Suvorov Military Museum in St. Petersburg. 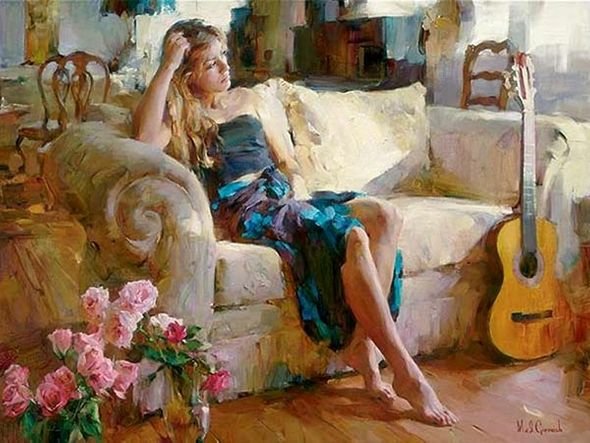 Ms. Garmash, born Inessa Kitaichik in 1972 Lipetsk, Russia, has excelled in the arts since early childhood. Proving herself in ballet, gymnastics and music, Ms. Garmash attended classes in all three disciplines and, after graduating from music and ballet school, entered the Lugansk Fine Art School at age fifteen. At seventeen she was accepted as that year's best undergraduate to the Lugansk State Fine Art School.